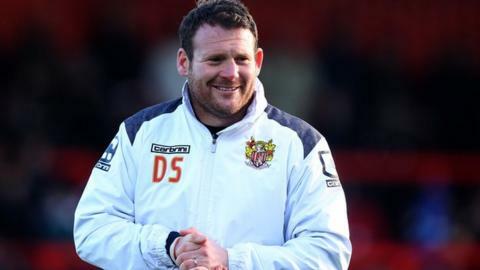 Stevenage caretaker boss Darren Sarll says he has not yet thought about the prospects of taking the role full-time. The 32-year-old was first-team coach under Teddy Sheringham, who was sacked with the club 19th in League Two. "The way I see it is this is my club and whatever the football club sees is the best pathway and future for them, I'll be happy," he told BBC Look East. "I would just like to get the opportunity to take the club out on Saturday and get it out of the way." Sarll, currently the bookies' favourite, continued: "I'm really looking forward to Saturday, it's going to be a big moment for me and after that we'll see what happens. "Emotionally I think my thoughts will be pretty much led by what happens in fixtures, but I've absolutely not thought about it in the slightest - the phone hasn't stopped ringing, it's not allowed me to think anything other than what's going on now." The former Brentford and Rotherham coach was given the chance to step up from the youth team to the first team in the summer by former England striker Sheringham, who left his job on Monday with the club having taken only three points from the last eight games. When asked about his style of play, Sarll said: "I go to football matches to see goals go into the back of the net. "Why would I want to go to a football match to see people pass it back to the goalkeeper? Why would I want to see the goalkeeper have more touches than a centre forward? I don't. "I like to score goals and I like to score them quickly, not for the detraction of keeping the football and playing with a bit of style, but my teams play with a bit of steel."